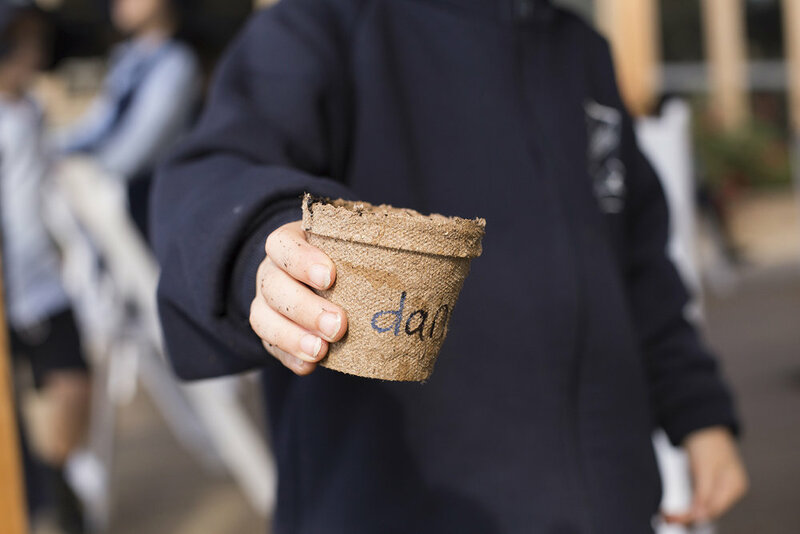 At Pocket City Farms we believe that the future of our food system and sustainable environmental practices lies in the hands of the next generation. So, we've developed a curriculum-based primary education program that aligns directly with the NSW syllabus and its fundamental Key Learning Areas of Science + Geography. Pocket City Farms now offers a unique opportunity for education for schools in Sydney and further afield to visit and learn on our working market garden in the middle of the city. Read more about why we have developed this program in the banners below, or jump below to view our workshop outlines for each primary stage. Hold tight for a partnership involving updated workshops focusing on Indigenous land management and ATSI areas of focus within the curriculum! In June 2016 we opened the first urban farm in Sydney, at Camperdown Commons. Our farm is a productive hub the local community can gather to learn about all things farming and food growing, buy locally-grown, chemical-free produce, participate in our composting program, and take part in many workshops and events. Importantly, the farm is a place to visit, enjoy productive green space in the city, dig your hands in the soil, and learn all about where exactly our food comes from and how it’s grown! Australia’s food system is facing tremendous challenges in this current day and age. Challenges that are the product of decades of increasing industrialisation and consumer demands. This problem is extremely complex, but has resulted in a disconnection that people have with the food they eat and the people who grow it. With this disconnection comes the domino effect of lost food skills. This umbrella idea encapsulates the choices and actions that drive the sourcing of food, the growing of food and the cooking of food. The solution lies in the hands of the next generation. By educating children and young people about food, the way it is grown, sustainability and ethical decision making surrounding this huge umbrella idea of food, we can take small steps toward achieving real behaviour change. It’s all about enlightening children about the beauty of growing their own food and the benefits as a whole. Much research has found that when children are exposed to authentic food and sustainability education early in their lives, chances are that they will continue along a path of holistic lifestyle approaches in the future. We’ve developed a stage based, primary education program that aligns directly with the Australian Curriculum. Workshops have been carefully designed to be integrated into the New South Wales syllabus' Science and Geography units of work, while incorporating cross curriculum priorities; Aboriginal and Torres Strait Islander Histories and Cultures and Sustainability. Our education program has been designed to directly be incorporated into Science and Geography units of work. This is to ensure relevancy within the New South Wales curriculum, and allow easily incorporated out-of-school excursions to be approved by schools. We want to make it easy for educators to bring students here. Within each stage and when realistic to what we can offer here on the farm, workshops have been created for units and content in Physical World, Earth + Space, Living World, Material World and Built Environments. WORKING SCIENTIFICALLY: Relevant skills will be utilised as children investigate questions and predictions by collecting and recording data, sharing and reflecting on their experiences and comparing what they and others know. WORKING TECHNOLOGICALLY: Children will be solving real world problems and creating ideas and solutions in response to needs and opportunities in a range of technological contexts, specifically, a small-scale agricultural environment. We have used Geography units of work to form the foundations of focus points for workshops. Like the Science units, workshops directly relate to NSW syllabus points to ensure relevancy within the Australian Curriculum. From Early Stage 1 to Stage 3 there are appropriate workshops available for each content area. By creating this learning platform, we hope to stimulate children's curiosity and footprint on this Earth. Through hands-on experiences they will begin to grasp an idea of the important interrelation between people, places and the environment. Literacy underpins most workshops with Speaking and Listening and Writing and Representing being natural components of sessions due to their interactive nature. Children will constantly be communicating and reflecting whilst drawing upon their own experiences to make new connections in a contextualised way. Numeracy skills will also be practiced as we aim for children to recognise connections between the areas of mathematics and its relevance to all aspects of life. Children will practice problem solving and critical thinking skills in areas of focus covered in our workshops. At Pocket City Farms we are strong believers in Indigenous cultures and history being taught and shared by those who have lived the culture themselves. We will be partnering with Indigenous teachers to teach aspects of Indigenous ways of life and sustainability. These workshops will be designed based upon what is of focus within each stage. Sustainability forms the foundation of our very existence here on the farm. We are aiming for a completely closed loop system, of which no waste is produced on the farm, yet is incorporated into it. This flows through to our broader food and environmental ethics. With the notion of ’sustainability’ being such an engrained value and practice here on the farm, each workshop automatically covers aspects of it. Whether it be waste management, water use, environmental care and respect or diversity within ecosystems, children will leave with a greater understanding of the numerous yet important facets of sustainability. All you need to do is bring the class. We’ll sort the rest. Pocket City Farms now offers a unique opportunity for education for schools in Sydney and further afield to visit and learn on our working market garden in the middle of the city. We currently run workshop excursion programs for primary and secondary school students, as well as early childhood groups. (Tertiary are also available, currently by request.) For the full info on our excursion programs, head to the links for each stage. There, you'll find the program and stage outlines and information sheets. Classes available every day of the week, with times also flexible. Most workshops run for 2 hours in total. With some longer programs designed for Stage 2+3. Depending on the workshop and the dates chosen, we can accommodate up to 100 students rotating around the farm at one time. If you are planning an excursion for more students than this, get in touch and we’ll find a solution. Prices range from $15-$40. (The higher prices are only associated with longer workshops or four week programs.) Workshops have a minimum of 20 students / $300 booking fee. Pocket City Farms is a not-for-profit association. Your fees are a contribution to continuing the work we do in local food, education and community. Thank you for supporting our farm project by way of your excursion booking.